I know I promised the Cassoulet/Cass-Olé recipe this week, but the photo gods did smote me mightily by making my pictures blurry—“pun”ishment comes in many forms—and it will have to wait until next issue. What I’ve got instead is a take on eggplant parmesan made more as an individual serving rather than a warm mass of layered sautéed eggplant, cheeses, and tomato sauce. And because everything tastes better when you put an egg on it, I topped it with a poached egg. 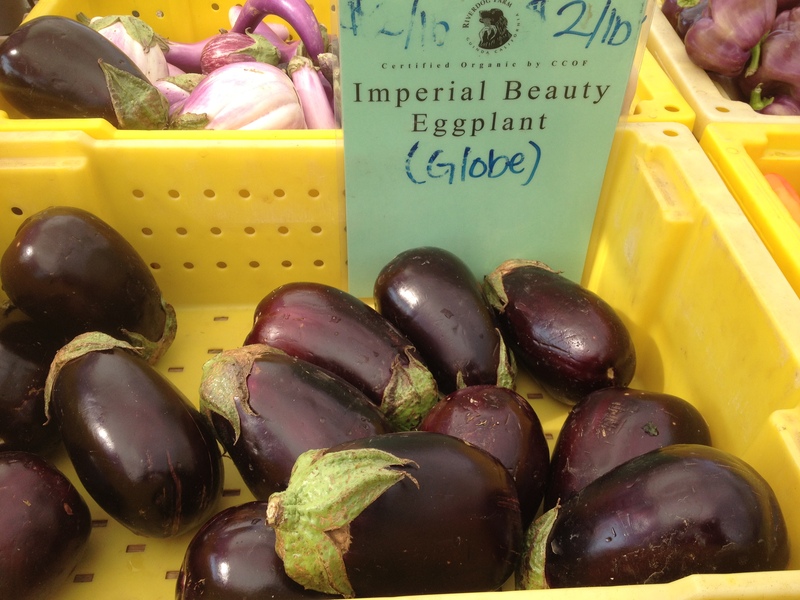 I had picked up the eggplant from Shooting Star at the Saturday Berkeley Market. Remembering an old recipe that I had made for friends in Rome in the mid-‘80s, of eggplant breaded and fried with a tomato sauce, I wondered if I could stuff the eggplant. I also picked up some dry-farmed Early Girl tomatoes from Quetzal Farm. (Dirty Girl Produce has some lovely ones as well.) Dry-farmed Early Girls are a Northern California delicacy. They aren’t watered after they set, and the plants put all their energy into the fruit. The plants are desiccated and puny, and the fruit grows small and sweet—so sweet that when I brought some back East for my parents last year (in an egg carton within my luggage), my father complained, “They’re too sweet.” I blame Pittsburgh weather and decades of supermarket tomatoes. Portion note: This recipe serves two, as a first course, or a light dinner. You’ll need one eggplant for every two people. Bigger eggplants mean bigger portions, so your mileage may vary. Preheat the oven to 375°. 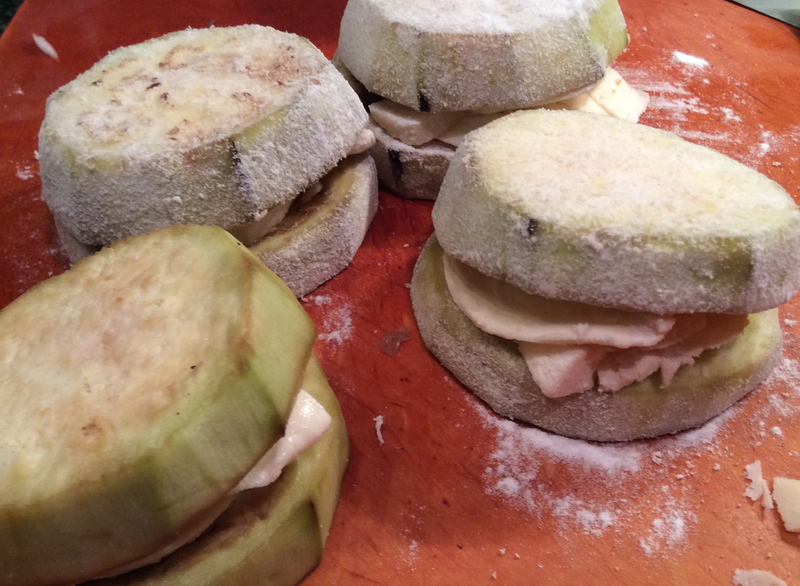 Peel the eggplant and cut crosswise into two 1 ½ inch thick slices. Slice through the middle, not quite all the way through, and—opening it like a clam—scoop out some of the eggplant pulp. I have forged a curved blade that works well for this, but a spoon or paring knife will do the trick. Chop up the pulp for the sauce (as well as the parts of the eggplant top and bottom). Salt the eggplant inside and out, and let it sit while you start making the sauce. Salting is a way to reduce any bitterness in the eggplant, though really fresh eggplant usually doesn’t need it. Heat the olive oil in an oven-safe frying pan (I use a Le Creuset). If you don’t have something that will work, you’ll have to move the sauce into a baking dish later. Add the chopped leeks, onion, and chopped eggplant bits to the pan, and sauté five to 10 minutes, until softened. Add the garlic, spices and tomatoes, and sauté on medium heat. Slice the mozzarella and parmesan, and stuff into the eggplant. It doesn’t have to close completely, but it should primarily be inside. Put the rice flour in a paper bag, and placing the eggplant inside, gently shake it to coat. 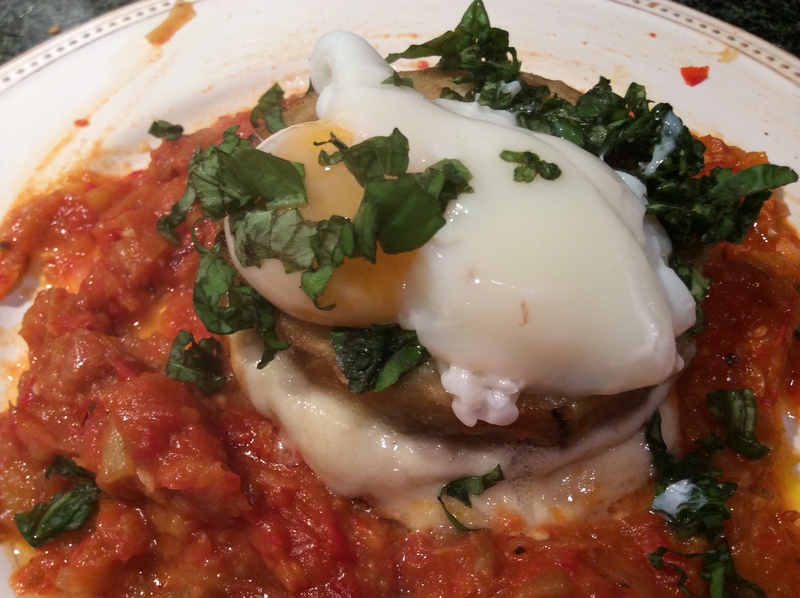 Be sure to leave a little mozzarella to top the eggplant while it bakes. 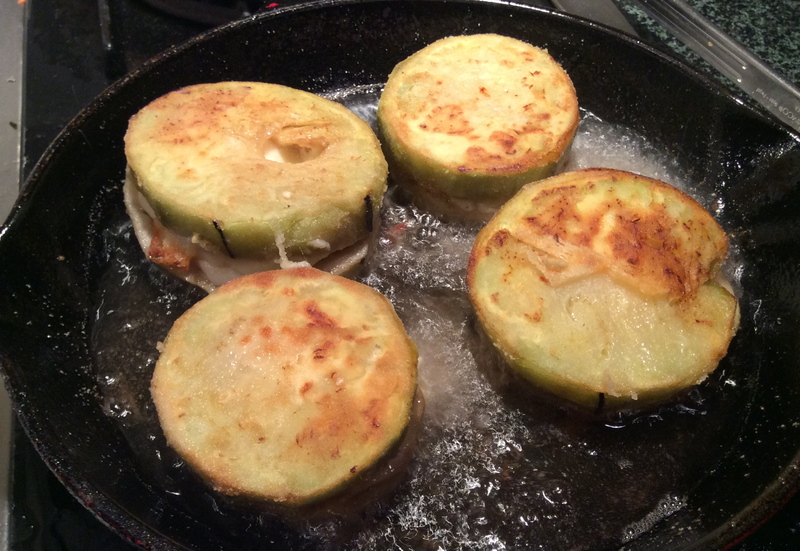 Put about a ¼ inch of olive oil in a pan, and after it’s good and hot, add the eggplant slices. Sauté until you get a nice light brown on each side, which will take a couple of minutes. At this point, you have a choice about how to finish the sauce. I like to puree it a little in a food processor so that it’s smoother. You can omit this step and it’ll all taste the same. If you’ve pureed the sauce, pour it back into the oven-safe pan you’re using, and add the eggplants to the pan or dish. Top with a little of the mozzarella, and put in the oven for 15 minutes or so, until the mozzarella on top is melted and a little browned. I know people who are terrified of poaching eggs. Just remember that it’s better to be a little under than a little over, and that either way is fine. Heat the water and vinegar in a small sauce pan until simmering. Crack the eggs into individual cups and pour them quickly into the pan of simmering water. You want to wait until the white is mostly set and you can still see the yolk as soft. When the egg is done, lift out of the water with a strainer, and if the dish isn’t out of the oven, place it into a shallow pan with lukewarm water to wait. Chop the basil into julienne for the garnish. Remove the eggplant from the pan, put a slice on a plate, and surround it with the tomato sauce. Top with an egg, and the basil garnish, and serve immediately. 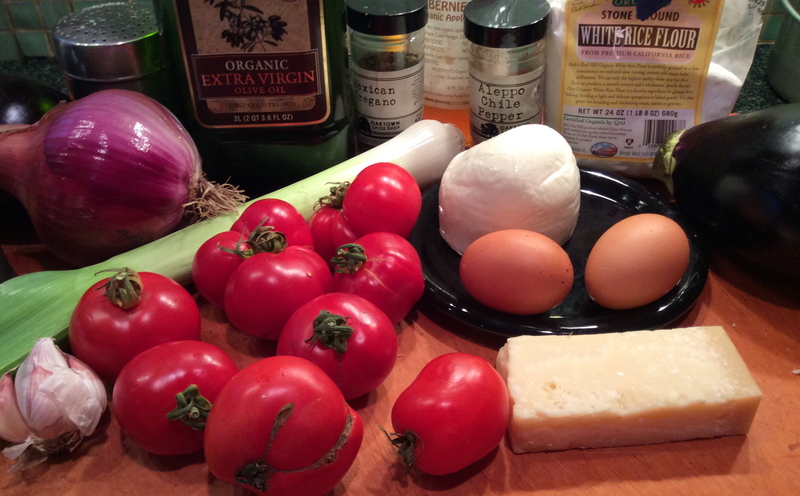 This entry was posted in Eat and tagged basil, Eat, egg, eggplant, Italian, parmesan, recipe, The Secret Restaurant, tomato. Bookmark the permalink.